Catherine Spaak (born 3 April 1945) is a French-Italian actress and singer. 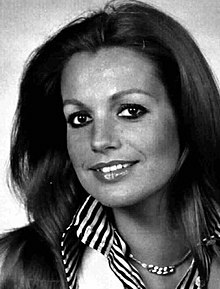 Catherine Spaak was born at Boulogne-Billancourt, Hauts-de-Seine (Ile-de-France). Spaak married her current husband, Vladimiro Tusellie, in 2013. Spaak spent most of her career in Italy, where she became a teenage star. From age 15 to 18, Spaak was the lead actress in at least 12 movies. As a singer, she was regarded by some as the Italian equivalent of French chanteuse Françoise Hardy, some of whose songs she recorded in 1963. She recorded under the label DET under the direction of Maestro Ezio Leoni, who had previously also produced Françoise Hardy. ^ Degli Antoni, Piero (6 April 2014). "«Gli attori, che mascalzoni» La signora Spaak si racconta". La Nazione (in Italian): 29. This page was last edited on 18 April 2019, at 22:04 (UTC).